Aldo Baerten is Principal Flutist at the Royal Flemish Philharmonic, conducted by Edo de Waart, Philippe Herreweghe and Martyn Brabbins. He is Professor for flute at the Royal Conservatoire in Antwerp, at the Hogeschool der Kunsten Utrecht (NL) and gives masterclasses on 4 continents, in such distinguished schools as the Royal Academy London. Aldo Baerten is former Professor for flute at the Sydney Conservatory. Since 2015 he is appointed teacher at the Münster Musikhochschule Germany. He is a regular guest at the Chamber Orchestra of Europe Mahler Chamber Orchestra, I Fiamminghi, European Union Opera, Arctic Philharmonic and the Rotterdam Philharmonic Orchestra. Aldo Baerten played as a soloist with eminent orchestras as the Südwestdeutsches Kammerorchester, RSO Basel, National Orchestra of Belgium, Walloon Chamber Orchestra, the Royal Flemish Philharmonic, Las Vegas and Kansas City Symphony, Samaai Sinfonietta under the baton of D. Stern, V. Czarniecki, P. Rundel, G. Octors, Z. Nagy, T. Yuasa, S. Byess, E. Aadland, R.Wilson, S.Mäkkilä. He is a regular guest at festivals around the world, together with famous musicians such as J.van Dam, Martin Helmchen, Severin Von Eckardstein, Martin Spangenberg, Niek de Groot, StorioniTrio, Michel Strauss, Alexei Ogrintchouk, Hervé Joulain, Kandinsky-trio, Jana Bouskova, Dietrich Henschel, Tatjana Masurenko, jazz pianist Jef Neve. Aldo Baerten has recorded extensively on Cypres, Phaedra, ECM, Pentatone and PMP and Principal Chairs. His recording of Schuberts Introduction, Theme and Variations on Trockne Blumen (die schöne Müllerin) with pianist Martin Helmchen was nominated for the BBC Music Prize of best chamber-music recording of the year 2010. 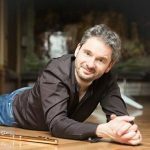 Aldo Baerten is a regular Jury-Member of the International Flutonicon Flute Competition, Axion Classics, Lyons-music-competition, NFA Young Artists Competition , Yamaha Music Foundation and Biwako (Japan).